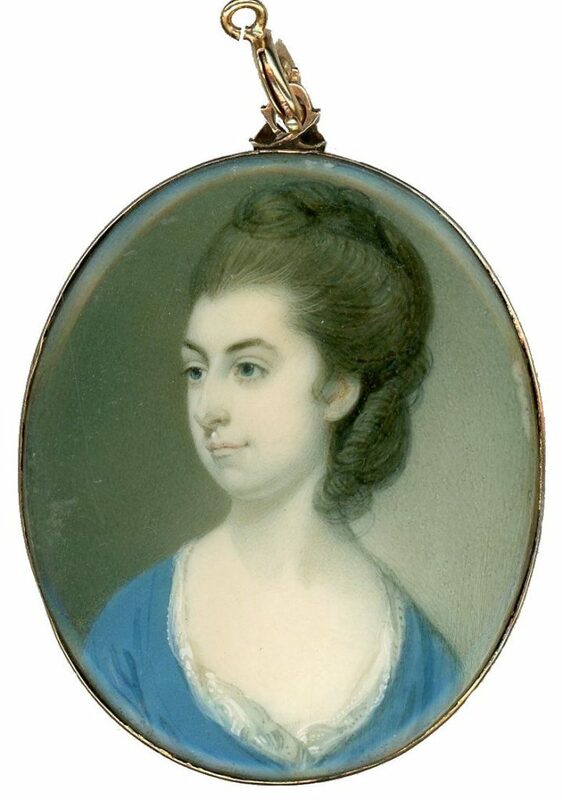 Dating to the last decade of the eighteenth century, this portrait shows an elegantly poised lady in a cornflower blue dress that tones with her blue-grey eyes. Her unpowdered hair has been curled and carefully coiffured with a loose plait. The portrait is set in a gold frame that is enclosed on the back. A native of Devonshire, Richard Crosse (1742-1810) was born deaf and dumb, as was one of his sisters. He began painting miniatures as a hobby and in 1758 won a prize at the Society of Arts that inspired him to study art. He became a successful artist and built up a distinguished clientele that included royalty. He fell in love with his cousin, Miss Cobley, but she did not reciprocate and married elsewhere, the disappointment reportedly turning him into a misanthrope.